The trouble with cute baby bears is that they grow up. Way up. A tiny endangered bear is being kept as a house pet and has all the creature comforts he needs after he was rescued from callous animal traders. 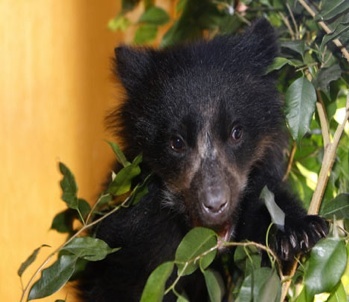 But two-month-old Koda the Andean bear cub cannot stay playing in armchairs and climbing house-plants for long. His rescuers, an animal rights organisation, are looking for a permanent home for the cub who could grow up to 6 ft and weigh more than 340lbs. November 11, 2007 Posted by oldstersview | animals	| Comments Off on The trouble with cute baby bears is that they grow up. Way up. Interstate 15 which runs up the western side of Utah doesn’t play tunes, it just plays an incessant high pitched whine from ridges across the driving surface. Really annoying after two or three hours. The purpose of the ridges? Shrug.